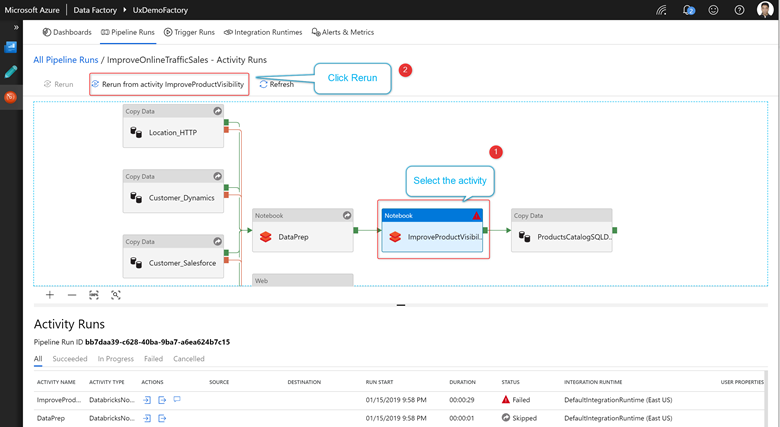 In this quickstart, you learn how to visually monitor Data Factory pipelines without writing a single line of code. 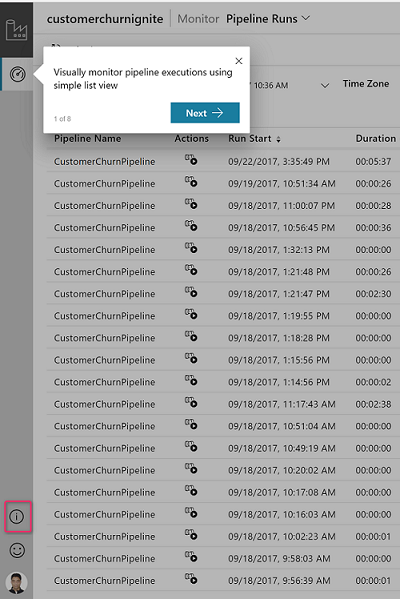 Monitor pipeline and activity runs with a simple list view interface. All the runs are displayed in the local browser time zone. You can change the time zone and all the date time fields snap to the selected time zone. 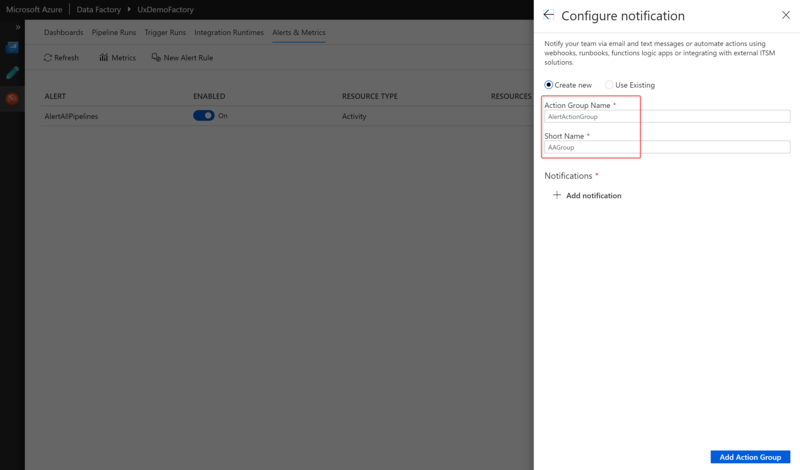 Navigate to the created data factory blade in Azure portal and click the 'Monitor & Manage' tile to launch the Data Factory visual monitoring experience. Pipeline Name Name of the pipeline. Actions Single action available to view activity runs. Activity Name Name of the activity inside the pipeline. Activity Type Type of the activity, such as Copy, HDInsightSpark, HDInsightHive, etc. 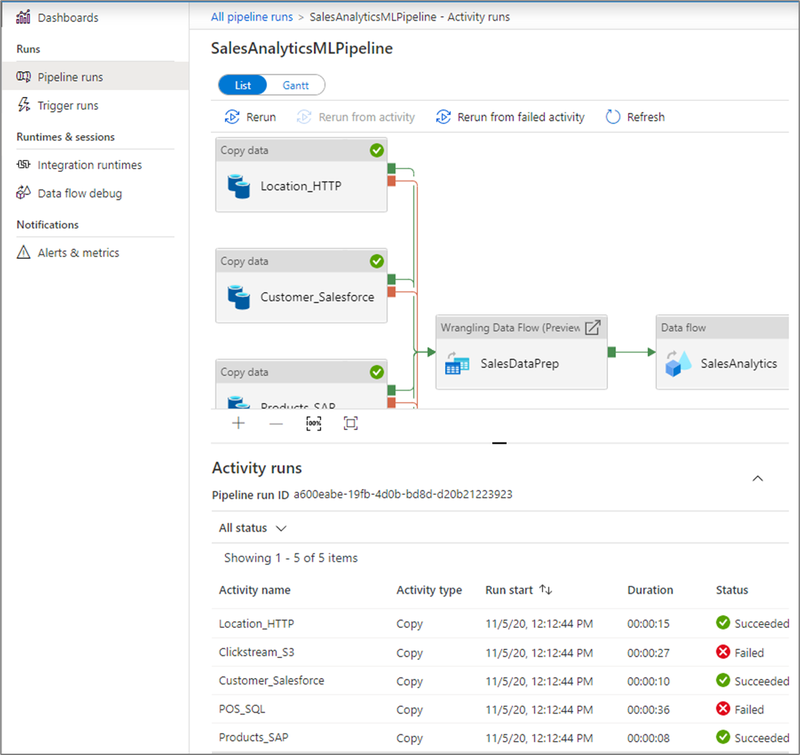 You need to click 'Refresh' icon on top to refresh the list of pipeline and activity runs. Auto-refresh is currently not supported. Hover on the Data Factory icon on the top left. 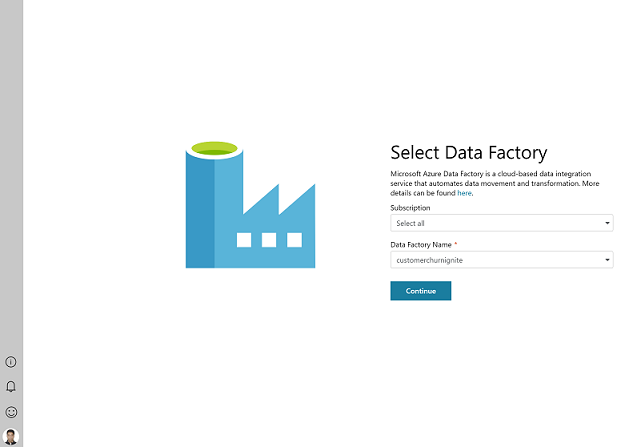 Click on the 'Arrow' icon to see a list of azure subscriptions and data factories that you can monitor. Pipeline Name Name of the pipeline. Options include quick filters for 'Last 24 hours', 'Last week', 'Last 30 days' or select a custom date time. You can promote any pipeline activity property as a user property so that it becomes an entity that you can monitor. For example, you can promote the Source and Destination properties of the Copy activity in your pipeline as user properties. You can also select Auto Generate to generate the Source and Destination user properties for a Copy activity. You can only promote up to 5 pipeline activity properties as user properties. After you create the user properties, you can then monitor them in the monitoring list views. If the source for the Copy activity is a table name, you can monitor the source table name as a column in the activity runs list view. You can now rerun activities inside a pipeline. 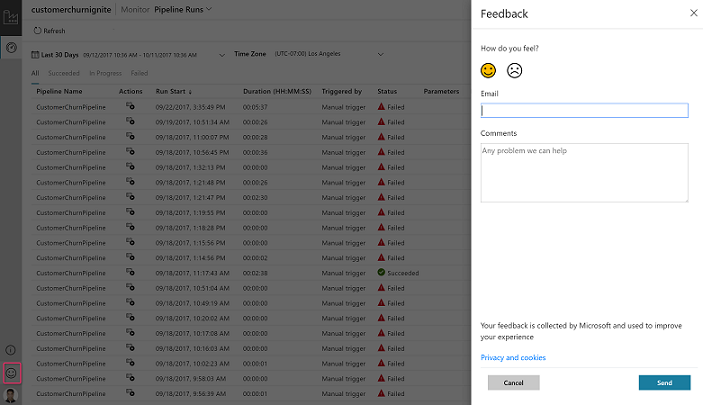 Click View activity runs and select the activity in your pipeline from which point you want to rerun your pipeline. You can view the rerun history for all the pipeline runs in the list view. You can also view rerun history for a particular pipeline run. Click on the 'Information Icon' in lower left and click 'Guided Tours' to get step-by-step instructions on how to monitor your pipeline and activity runs. Click on the 'Feedback' icon to give us feedback on various features or any issues that you might be facing. 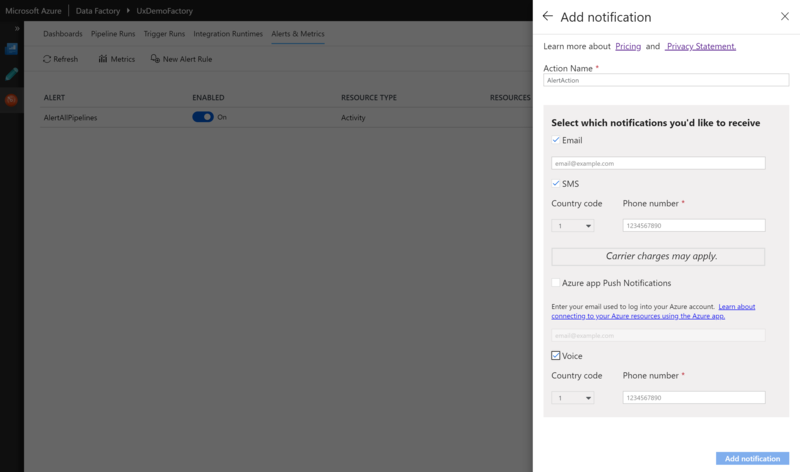 You can raise alerts on supported metrics in Data Factory. 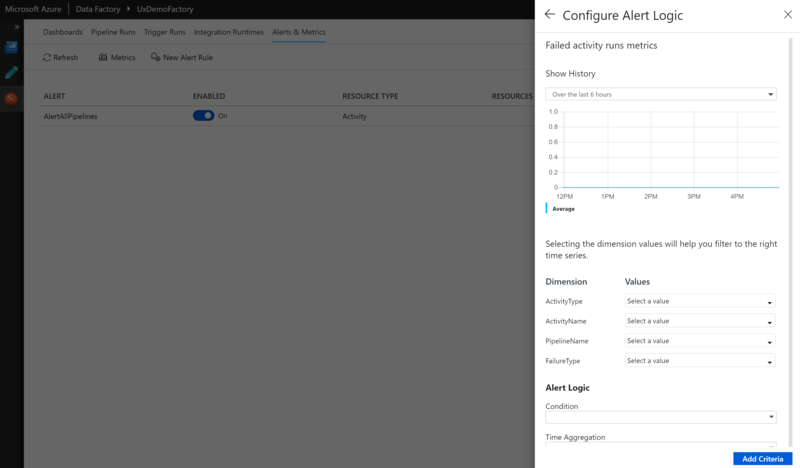 Select Monitor -> Alerts & Metrics on the Data Factory Monitor page to get started. 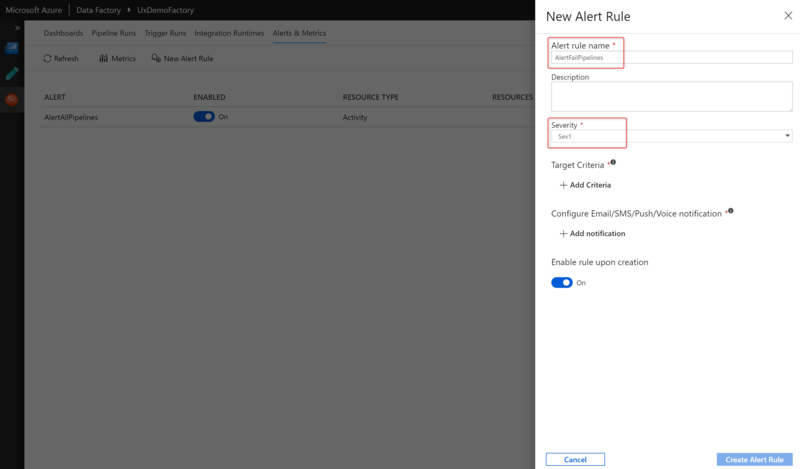 Click New Alert rule to create a new alert. 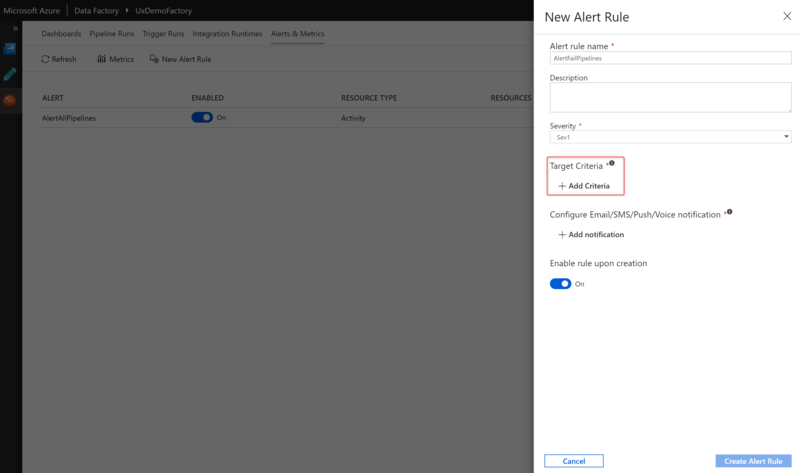 Specify the rule name and select the alert Severity. Configure the Alert logic. You can create an alert for the selected metric for all pipelines and corresponding activities. 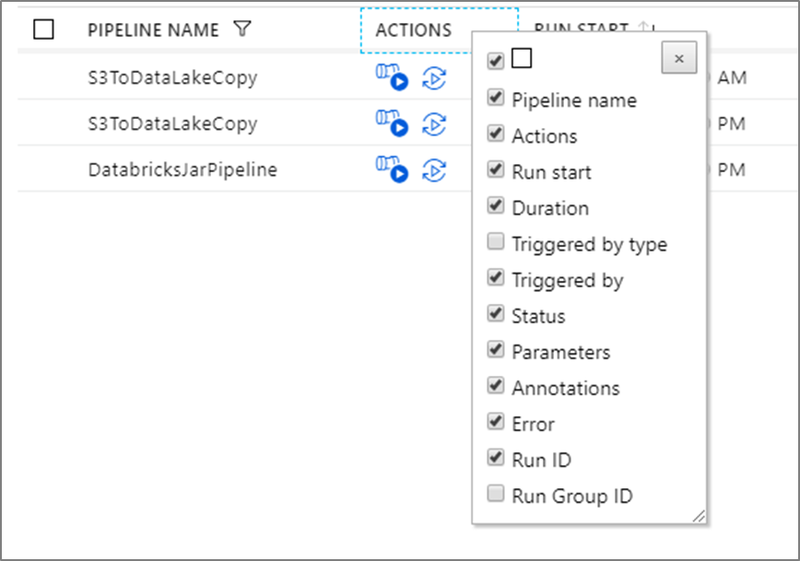 You can also select a particular activity type, activity name, pipeline name, or a failure type. Configure Email/SMS/Push/Voice notifications for the alert. 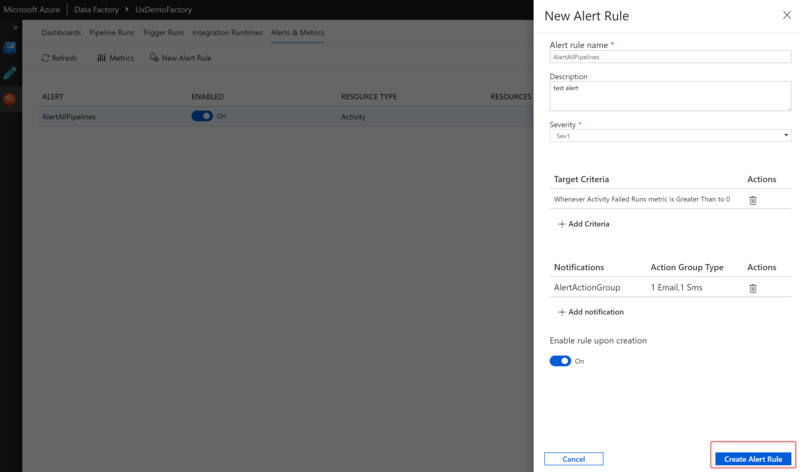 Create or choose an existing Action Group for the alert notifications. 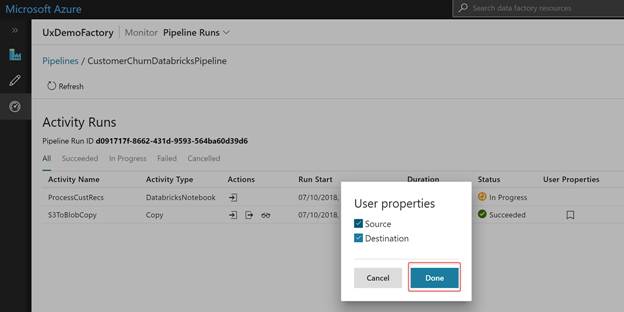 See Monitor and manage pipelines programmatically article to learn about monitoring and managing pipelines.